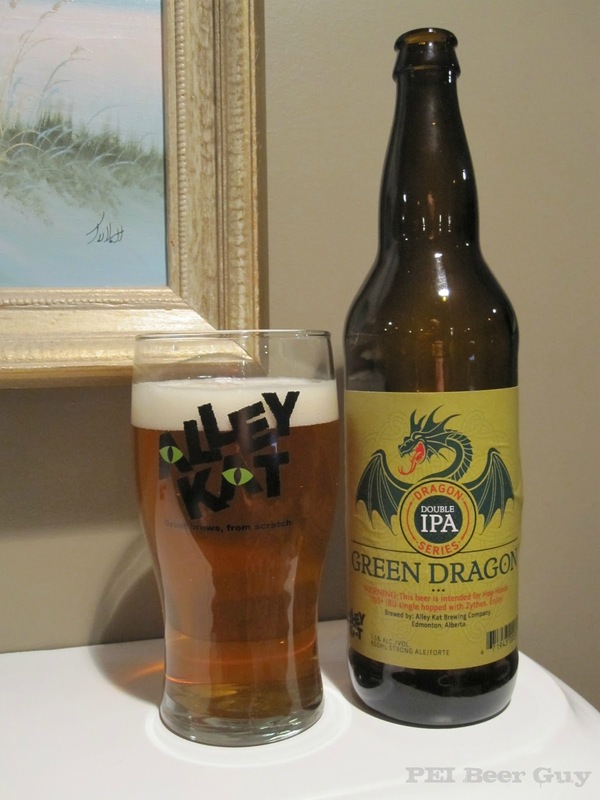 I have high hopes for this, my third Alley Kat brew, even though I had issues with every bottle of another of their offerings (my optimism stems from my own nature plus the other really enjoyable Ak brew I had). The head on this is modest, creamy, and white. The lacing is solid, all the way down. The beer's clear, and rather pale for a double IPA, I thought. There are some slow bubbles rising in the glass. This is brewed with one hop, Zythos, which is actually not one hop - it's a proprietary blend of other hops that are trying to emulate the best traits of a mix of other hops. Make sense? Aroma-wise, I was expecting citrus, lemon, pine - the first whiff smelled more like Keith's - not good. I'm figuring this one is another bust. Once it was in the glass, though, it was more like light spice, maybe some Fuggles-like earthiness, and some light citrus. Much of what I enjoy from my beers is the aroma, and this one underwhelms. Does this one have a lot of caramel malt, like their pale ale? It's caramel-y... but more drinkable than the FMPA's I had. Some pith comes out about 1/4 of the way in. After the smelling, and with this, the hops come across most like Northern Brewer and Cascade to me. That's up for debate, though. The feel or body of it is rather medium - very smooth and slick, with a finish that's just a little slick. It's not really resinous or anything like that. The carbonation's fairly strong at first but vanishes quickly. Not sure what you happen to be drinking, or perhaps it doesn't travel well. I'm onto my second case and I see everything and more of what you were looking for and none of what you were describing. It must not travel well, I'm guessing, which is disappointing as well as perplexing (why doesn't it?). I expected more from this and the Full Moon Pale Ales (which came via two different methods). My one shining AK star so far has been their Cringer. Great brew. They have one chance left in my fridge at the moment - an Abbey Kat. Hopefully it's good, and improves their average to .500!